Series looking at Britain's traditional markets. A focus on the Spalding Plant and Vegetable Auction in Lincolnshire, the biggest market of its kind in the country. Browse content similar to Spalding 2. Check below for episodes and series from the same categories and more! they're still the best way to conduct business. At 1,600. Blow your nose and bid again. We'll be visiting the UK's most dynamic traditional markets. They'll be bargains to be had today. -That's part of being at an auction. Today, we are in Lincolnshire at the UK's largest horticultural auction. -36? We've got another 12 to come, then. On we go then to the cabaret. 110. 120 has the lady bid. Gentleman, 130. -Yeah, do the best you can and don't mess about today. ..and following the fortunes of three buyers and sellers. and go home with some bargains. -You've got accommodation down in DC. Sometimes it's dread news and sometimes it's good. Oh, they break your heart with this, don't they? the largest county in the East of England. It's famed for its big skies and rich soil. A quarter of all the UK's plants and vegetables are grown here. This one, that one, that one. He grows a few varieties, then. in this heartland of British horticulture. People come people come from a radius of 50, 60 miles here today. Some really nice stuff, yeah. Nice bit of colour. Good value for money on that. 10p to 20p per plant could make a lot of difference. and often attracts as many as 40 buyers. They all taste the same, don't they? a veg auction, selling over 1,000 bags and boxes of veg. selling 16,000 flowers, plants, and shrubs. It takes two auctioneers to do the selling. It was going a little bit funny earlier. or the previous day. So it is very fresh. And Ady Williams on plants. and knowing what you're selling. and what sort of money they're looking to pay. So you've virtually know you've sold it before you do. -It's a ginseng plant, look. for the region's many smaller growers. Lots of the local farmers are quite small. so they're not big enough to sell to multiples. This is the perfect outlet for them. Time for the auction to begin. -Did you miss me last week? because it won't be fresh tomorrow. We could have 500 lots. So we do move through an awful lot of produce. We have to go pretty quickly. We're on a time limit. We have to start at 11:00 and have to be done by 12:30. Now we have the sprout stalks. These are in fives. Five lots on offer. Stop me at £1. £1 bid. mostly purchasing for their own shops, restaurants or market stalls. 2.80 right at the back. Any further bids? We're at 2.80. Are you bidding, sir? No. 2.80 then. Right on the back row. There's a lot to sell and a need for speed. like Wimbledon umpires on wheels. five, six foot up in the air. we'll bring the goods in front of a fixed station. But we are not, we are portable. is quality veg from highly experienced producers. If you want to buy, you just buy. We've got a good relationship with all of our growers. so they know we're going to do a good job. I really would like to start at £2 today. All right, after you, keep going. They don't come much more regular than seller John Dix. He's been bringing his produce here for nearly four decades. They are good stuff, whoever they are. They come from a long way away here, you know. John has nearly a tonne of potatoes for sale today. But there's a UK potato glut right now, so he's worried. It's a bad year to sell potatoes, because such hellish yields. some of the growers are not even going to lift them. Some of the bigger growers. Probably an average yield will be 20 tonnes per acre. Some of these fellas, this year, are talking about 30. Maris Pipers, are, in his view, irresistible. definitely the finest chipping, eating potato in all of the world. And that's a fact, sir. because his sales at the auction produce most of his income. John lives with his wife Jackie just six miles from Spalding. They've been farming their 100 acres here for the past 40 years. man and wife working together. they grow a variety of crops throughout the year. The field we're in now is sprouting broccoli. We grow seven different varieties. It's a beautiful, beautiful thing to eat. Eat it how you want. and there's only one variety that counts. There variety we grow is always Maris Piper. but South Lincolnshire Maris Piper. Again, I'm very biased, obviously. I'm going to be, aren't I? We should be ready to start grading, then, ready for tomorrow. That's hope they make some money. You never know your luck. It's got a beautiful taste. Easy to chip for the fish and chip shops, on a commercial basis. It's just like cream, without cream on it. John and Jackie harvested all these potatoes about a month ago. so they can keep their customers supplied throughout the winter. that are too small to sell. before being bagged up by John. this would be stacked automatically. The only automatic thing about this pallet stacker is me. The couple harvest about 100 tonnes of Maris Piper every autumn. -Take that one across the bottom. under a special potato blanket. Put that one up a bit. and, for John, it never stops. so you've got to keep earning, as any business has. You never know what's round the corner, really. We all understand the nature of trade and trading. You can't always have the top dollar. You can't always win, you know. the auction could be challenging for John. No, no, no. No, no! ..for potatoes, last year, because there was just not the crop. But always, when that happens, you're in trouble the next year. Because everybody jumps in and too many grown. which is good, you know. If we meet that target, I'll be overjoyed. You've picked the dodgy trolley, haven't you? So are we on number 980? twice a week through the winter. knowing where it's grown and they can trust the product. loaded in ten kilo and 25 kilo bags. and £1.80 for the larger ones. We all put a reserve price on. Which I do. A low reserve, because I want the product to go. For John, it's as much about pride as it is about prices. So he takes his opportunity to check out the competition. just to see what the opposition's putting up front today. you know. It's my own little research. John's spotted something that's cheered him up. There are very few Maris Pipers here. and you can see there's quite a lot of potatoes in. This year, there does seem to be a shortage of Maris Piper. Because it's a very difficult potato to grow. you chuck down in the field and they grow on their own nearly. that Jesus can throw at it. And unless you're ready for it, you'll get caught out. it's definitely reaping a benefit. because that might fall to bits today, but we'll see. -Right, here you are then, Ian. Yeah, do the best you can and don't mess about today. All right? Get shot on them. -Thank you. See you tomorrow. because he is keen to get back to work. He'll find out what his produce gets after the event. we trust the auctioneers and what's the point? Crack on, go home, do something else. love his Maris Pipers as much as he does. Got a bid here at £5. John's potatoes are about to go under the hammer. so the likes of Mr July and Mr Mash are getting ready to do battle. We'll move along now to the Piper. Maris Piper. In the ten kilo bags. 40 on offer. Stop me at £1. £1 bid. One, 1.10, 1.10. First up are the 10K bags. John was hoping for a minimum of £1 each. Anybody else, 1.40? 1.50. 1.50, just here. Just in front of me. Do you want to go again, sir, on the back? I'm taking this bid at 1.50. But the bidder only wants five bags. The remaining 35 are offered back to the losing bidders. 1.50. Any advance on 1.50? Do you want to go again, sir? 1.50. If they aren't taken, they might be going back to John. I've got a bit at the back of the room for 1.50. And clears means that he's bought all of them. Next up is the larger 25K bags. John's brought 20 to sell and has set a low reserve of 1.80 per bag. 20 on offer. Start me at 2.50. Got the bid just in front of me. 2.50. I can't see any more hands, can you? The winning bidder for John's spuds pays 2.60 for each bag. But it seems he also doesn't want the whole lot. Five left. Who's in for the last five? Nope. On we move, then. Thank you, Mr Margin, we're clear. It's good news for John. His Maris Pipers have done him proud as he's sold all his bags. Tonight, he'll get the total figure. Lincolnshire is Britain's most important county for growing. A quarter of all UK veg production happens right here. nearly one in four of the population work in agriculture. Agriculture and farming is the lifeblood of this area. there's an agricultural manager for the area from each bank. making it the third most important business in the region. as a hub for buying and selling the region's output. But it remains the beating heart of the county's agri-business. because they know the product is fresh. They can see it with their own eyes. Cromer clears. We have two more boxes. The auction tradition for bidders to have codenames goes back some years. At 90 bid. I thought you were thinking about bidding, Mr Monster. it also allows buyers to operate less obtrusively. When you first register with the auction house, you are given a name. I was allowed to pick my name, so we picked Halo. We're still going up here at 1.65. I'll say it's Mr whoever wins the bid and they'll go like that. And that's how many they want to buy. Sprout stalk. These are from our finest grower. Let's not muck about. 1.50. I changed the fertiliser this year. to keep their businesses running. Buyer James Dawson owns a fruit and veg stall in Scunthorpe. The auction is vital for him to keep his stall going. to have any chance of making a profit. or it's grown in that area. It does seem to sell better. I'm quite reliant on Spalding auction. Price comes into it. and that way I sell a little bit more. Hi there, are you all right? Anything else I can get you? Just that, yeah? Just 95.
one of the best looking stalls on the market. So when that came available, I took the opportunity. It is all a bit new to me, really. I can't get enough of it, really, now. Yeah. Pretty much everything James sells is from the Spalding auction. His customers love the quality. But James knows he has to be very careful with prices. Supermarkets have had a huge impact on market traders like James. If his prices are too high, he risks having no customers. Pop them in there. It's all right. The economic superstore of the stall are stark. is needed to cover overheads. if he's to pay himself a wage at all. that can make a difference, sometimes, yeah. I'm just wondering why them carrots look like that. -Well, they're like red ones. stuff of the auction. It is cheaper than the wholesale market. Is that right? There you go, then. Thank you. it always works out cheaper than the wholesalers. There you are, look, there's a good 'un. At auction, James has to juggle two competing priorities. He has to get stock, or he can't run the stall. or he'll have no chance of making a profit. On we go, then, to the cabaret. No, we won't sing today. We sell a lot of the time and everybody wants the big 'uns. So there's a lot at stake today for young James. He needs the highest quality for the lowest prices. I can fill it and go home with some bargains. plans to use his knowledge of how the auction works to his advantage. He wants leeks, but he treads carefully. Next we have the leeks. These are in four and a half kilo boxes. of the same vegetable from one supplier. the auctioneer will offer the rest to others who have also bid. Let's start these of at 2.50.
allowing someone else to win the bidding. £3, on my left-hand side. Lady's bid at 3.20. 3.30, now, sir. 3.30 just in front of me. 3.40 on my left-hand side. So only three of the ten boxes have gone. The rest will be offered to the next highest bidder at the price they bid. Winner at 3.40 and we've got three left. Three to Magnolia. Three to Magnolia. Thank you, sir. We go to the rainbow carrots. for four boxes of leeks. While the top bidder paid 3.40 a box. James uses the same technique to get some bargain carrots. Would you like three, Mr Magnolia? And a host of other veg. Did you want to take five? He'll take five. known as under bidding, is designed to ensure that everything gets sold. because it's not going to last - it's fresh produce. 30 on offer. Let's go 1.50. And there is always good old-fashioned opportunism. He's not bidding at all on these cabbages. Seven. Ten to Mr Seven. he jumps in with a cheeky low bid. Let's move on to the next lot, then. Sorry? Mr Magnolia, would you like some? -Oh, they break your heart with this, don't they? -He goes 1.60. 1.70 now, you have competition. 1.70 just in front of me. But he's gone too low. Another bidder swoops in, ups the bid by 20p and wins. Outmanoeuvred, James loses the cabbages. Now we're going to the Stemster. Next, an all-rounder potato called Stemster. By going to go 2.50 again. 2.50 bid. 2.60, 2.70 at the back. 2.80, now. James needs spuds for his stall, so this time he's taking no chances. Do you want to go again, sir, at the back? No. Three. Are you bidding, sir, no? £3. I'm with you, sir. if you are the winning bidder. because that's quite easy to do. Look at all the anticipation. on his stall this week. We're going to start them off 1.50. Bid. He'll need to buy a lot more veg before the auction is out. Six miles away, potato grower John Dix is making that call. That's good. That'll be the bigger ones. Yeah. That's very good, thank you. Yeah, cheers, bye. See you Monday. The smaller bags were 50% above my reserve price. And the larger bags were 33% above my reserve price. So I'm very happy with that, so happy days are here again. I'm very happy, very pleased about it. but I would have had them whether the price was up or down! We Brits love our potatoes. and nearly 30% of the national crop is grown here in eastern England. And the number one UK potato? It's that relative newcomer the Maris Piper. over the last 100 years or so. The King Edward has probably been the best survivor. Still eaten now, well over a century since it was first introduced. Potatoes need great soil and there's plenty of that here. Spalding, the soil is very good, nice silt soil. a lot of potatoes and greens are grown. The soil is really good, because it never really dries out. It always holds quite a bit of moisture. And it's so easy to work. The rich soil is good for flowers, too. Tulip growing was once big business here. The industry is much depleted - gone to Holland and elsewhere. remains key to Lincolnshire's agri-economy. to the auction house as the veg. At 80p. At the back of the room, sir, at 90. You're being told off, Mrs Wisbech. I'm glad it's not just me that gets told off. with about half the 16,000 plants, shrubs, and trees already sold. With a resigned look on his face, Dixon. garden centres, and independent shops throughout the county. but who always finds time to come to the auction. It's not something you can do over the internet. Now we're going to azaleas. There's two lots of 12. Charles needs to buy around 4,000 plants today. But margins are tight, so the price must be right, too. At 1.60. I can't see movement at the back. about 65 miles from the auction. They started trading here nearly 20 years ago. My passion has always been plants. I opened my first garden centre in 1990. We've now built ourselves to a chain of ten. We ought to try and bring a bit more colour through here. Working in this world was always Charles's dream. I was probably only 11 or 12 when I sold my first plant. selling conifers, eggs, and bags of potatoes. That really gave me a bug for the industry. I've got a few pound in my pocket and I thought I'd won the lottery. and they would do it in the week. See if we've got some more stock. he's built one of the region's biggest horticultural businesses. a fun place for people to come out. Charles's vision is to make his garden centres an experience. The latest new attraction - dinosaurs. some of these were bought from a bankrupt crazy golf course. and gives our customers something to smile about. We get a lot of visitors coming. They can be here three, four, five hours, just to walk round. They do love the experience. The experience does its job, bringing in customers to buy plants. that's still the core of a garden centre. We sell anything from bedding, to trees, to house plants. of a modern garden centre. ..my benches after a busy day. These benches were full yesterday. with around 4,000 customers visiting today. Stock needs to be replaced quickly, so the auction is vital. I need to have bought probably two or three vanfuls. at, hopefully, a bargain price. there'll be some good house plants in there. It still gives me as bigger buzz now as it did do 30 years ago. I still love getting a bargain. 95. It's a Leicestershire bidder, ladies and gentlemen. Lovett. That's it, Miss Lovett clears. needs to buy 4,000 or so plants at the auction today. Found on the front row. So he'd better get stuck in. And he's off, bidding 70p a plant on some white cyclamen. -But he's up against rival regular buyer Chris Porter. Selling now at 80p. Mr Ray Manning. Not doing very well today. -There's plenty of time. Yeah. Seven lots of six holly wreaths. That's what you're bidding for, ladies and gentlemen. Were going to start the bidding offers £6. I think will make more bids. £6. Chris bids on the holly. Both raising the bid, ladies and gentlemen. At 7.20. Gentleman bidders are out now. Do you want to bid £7, WGC? Two, please. Charles kept them for what he bid, £7. How about you at 6.80, Mr Porter? But rival Chris Porter gets the rest at what he bid - 20p less. I hate it when he buys cheaper than me. Time for Charles to get his game face on. Calluna trio. Three colours in a pot. The tricoloured heather takes his fancy and he jumps in. At 75. Lancashire buyer, ladies and gentlemen. WGC, 80 bid. Now you're in the limelight, sir, five. At 85. You're out in the spotlight, sir. 90. That's it, sir. But another rival bidder's in there, too. And 95, but you've got competition, WGC. At 95p. Don't be beaten, WGC. July. And Mr July gets it. Would you like to big one at 90, WGC? -He takes the big lot at 90. As underbidder, Charles gets the bigger lot at 90p a plant. Now Charles really gets on a roll. Lot number 9, at £2 for the 10, bid. Even these reindeer pots can't throw him off course. By the time he's done, he's spent a little over £4,000. Got the volume he needed and, above all, some bargains. Yeah. Nice bit of colour. Good value for money on that. They were just over a pound. I'll probably sell them for about five. Today I think I've generally bought well. but very happy how the day's gone. Yeah. There should be some good deals for us and our customers. Enough to keep his garden centre empire well supplied. We're moving on to the celeriac. We've got 18 by 6. The veg auction is drawing to a close. to keep his market stall going. But with margins tight, he needs to buy at low prices. I'm not going to pay over the odds. -Hopefully, I'll get my carrots. Up next are dirty carrots. Cheaper because they are unwashed. We have the bunches first. Start me off at £50 bid. Thank you. £50. 55. 55, 60. 60, just in front of me at 60. Any further bids? We're at 60.
by trying to outbid his rival, James drops out. and he'll get what he wants at a lower price as underbidder. -Mr Magnolia, you were the only bidder. He's got bunches of dirty carrots at just 60p each. That's all for me, thanks. for another week and he's managed to keep his spending low. so prices are a little bit more expensive. But a few things I've missed out on, but there we go. Best buy today would probably be caulis, because they're in 12s. and so they've worked out cheaper than normal, yeah. It's been a good auction for young James. but has managed to get it all for less than £200. but should make enough profit to pay himself a decent wage. today's Spalding market is over. We'll see you again next week. people who sell on their gate. Luckily, they all turned up today, so it was really good. It speaks for itself on how important it is to all the buyers. They come from far and wide, all over the country, to go there. It was a good day, everybody's happy. A lot of people went home smiling. but John Dix for one is determined to remain philosophical. famous line from Rudyard Kipling's poem If. Success and failure, treat both those impostors just the same. Because this week you'll be up, next week you'll be down. So let's just take the mean from life and keep living. Lincolnshire is the heartland of UK horticulture, growing a quarter of all Britain's veg and Spalding Plant and Vegetable Auction is the biggest market of its kind in the country. They run three sales every week, selling as many as 1,000 bags and boxes of veg, and up to 16,000 plants, shrubs and trees each day. For the region's many smaller growers, they are the perfect sales outlet. Local farmer John Dix is selling nearly a tonne of potatoes today. 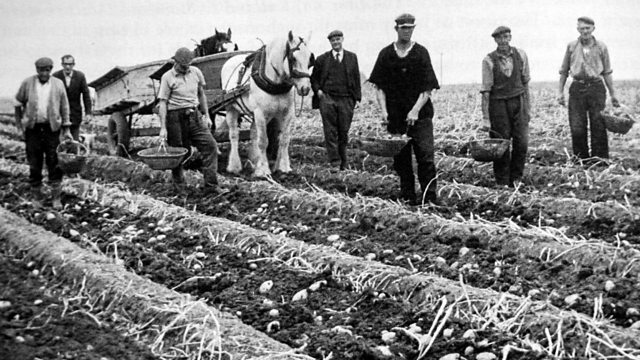 He's a man who loves his product: 'south Lincolnshire maris pipers are the best potatoes in the world. That's a fact!'. But there's been a national potato glut recently, so prices could be a worry. Buyer James Dawson has a bustling fruit and veg stall in Scunthorpe Market, 70 miles away. The Spalding Auction is vital for him. He has to strike a careful balance between getting the stock he needs to keep the stall running, but paying low enough prices that he can make a profit and pay himself a wage. Among the 30 or so buyers at the plant sale is Charles Stubbs, a man with a local empire of ten garden centres to buy for. He needs 4,000 plants, trees and shrubs today to fill two vans and keep the empire supplied.